Monday – Friday, 9 a.m. – 6p.m..
An All-Lines Agency to Suit Your Needs. Protect your family's finances when you choose auto and homeowners' insurance from our agency in Jacksonville, Florida. 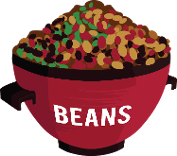 Beans Insurance Agency, LLC, specializes in providing quality insurance solutions for individuals, families, and the commercial/business sector. Our top priority is to serve the insurance needs of the community through personal and professional customer service that's second to none. As an independent agency, we have many carriers to serve the requirements of our most important resource: you. In addition to auto and homeowners' insurance, we offer a variety of individual and commercial insurance, as well as flood insurance. You'll find that we aim to provide you with the best solution for your investment. Call us at (888) 327-2793 in Jacksonville, Florida, for further information. Discover affordable insurance plans and excellent customer service from our agency in Jacksonville, Florida. Beans Insurance Agency, LLC, has the ability to offer quotes through several different companies to provide you with the best possible rates. We offer periodic policy reviews, where we look at your policy and amend your coverage for life changes. This service allows you to add new discounts or create a new policy.